The Matasya avatar story is as follows. The Satya Yuga was about to end and a great flood was to come and destroy all the life on earth to start afresh for the next Yuga. Lord Brahma after a day full of creation, was tired. He wanted to go to sleep and was soon snoring loudly. While Lord Brahma was sleeping an asura Hayagriva emerged from Brahma’s nose. With Brahma asleep, Hayagriva realized that it was the right time to take in all the knowledge of the Vedas. Hayagriva concentrated and soon absorbed the knowledge in the Vedas. He then hid deep inside the ocean, thinking that nobody would find him there. Lord Vishnu saw this and was worried. If the Vedas were stolen by the asura, the knowledge of the Vedas could not be passed on to the Next Yuga. As a Preserver, it was his job to make sure the knowledge survived to the next Yuga. In the earliest yuga (era) of Sata-yuga, king Manu was performing severe penance for long period. One day as he was performing ablutions with river water, a small fish came into his hands and just as he was about to throw the fish back into the river, the fish requested the king to save its life. Heeding its request, the king put the fish into a jar of water but the fish started growing and very soon the jar was not big enough for it. Then the king threw it into the river, but it soon it outgrew the river and the king then threw it into Ganges and then into the ocean. The king realised that it was Lord Vishnu himself and then the lord made an appearance and made a special request to the king. It predicted that the world would come to an end by a huge flood in seven days and requested the king to build a huge boat and take the seven sages (hermits), seeds of all plants, one animal of each type. 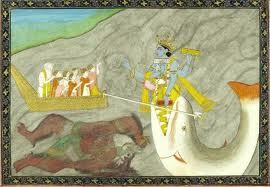 He told him that he would appear as a fish to propel the boat to Mount Himavan for surviving the flood to the next yuga(eon). True to his word, after seven days the Lord appeared and the king tied the boat to the fish by using the royal serpent Vasuki and the fish took all of them to Mt Himavan and kept them there till the flood was over and in the new era, the king started procreation a for the new era. 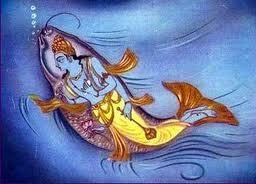 Thus, taking the Matasya avatar, Lord Vishnu saved the earth from destruction.